NJ shore – What Exit? The Jersey shore is known for beaches and boardwalks, but what’s for dinner? Cover, Leland’s Ocean Hotel menu, 1880s. Sinclair New Jersey Restaurant Menu Collection. 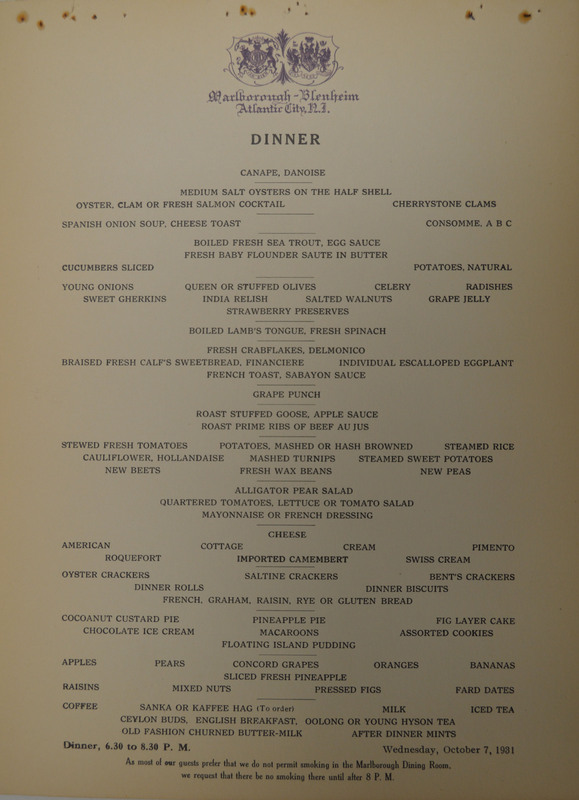 At the turn of the century, wealthy vacationers enjoyed elegant meals at oceanfront hotels. 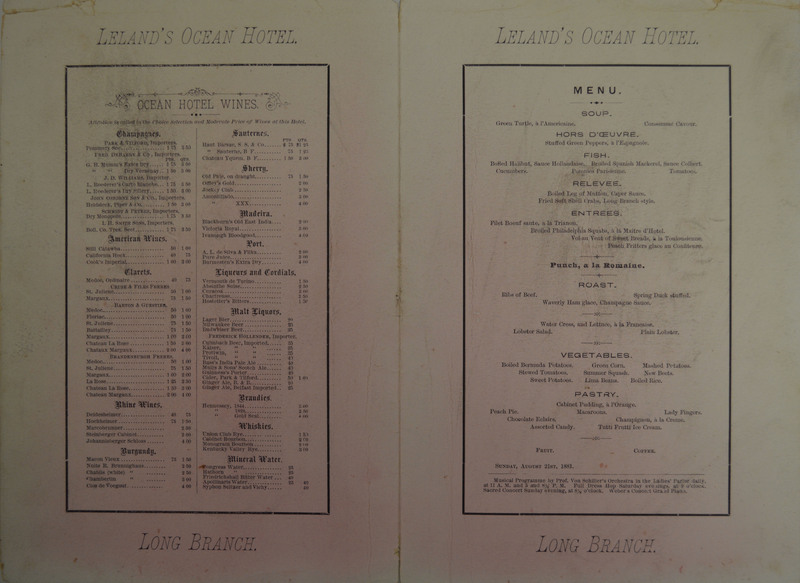 Guests at Lelands’ Ocean Hotel in Long Branch could choose from beef ribs, lobster, and halibut for dinner, and peach pie, chocolate eclairs, and tutti frutti ice cream for dessert. Leland’s Ocean Hotel wine list. 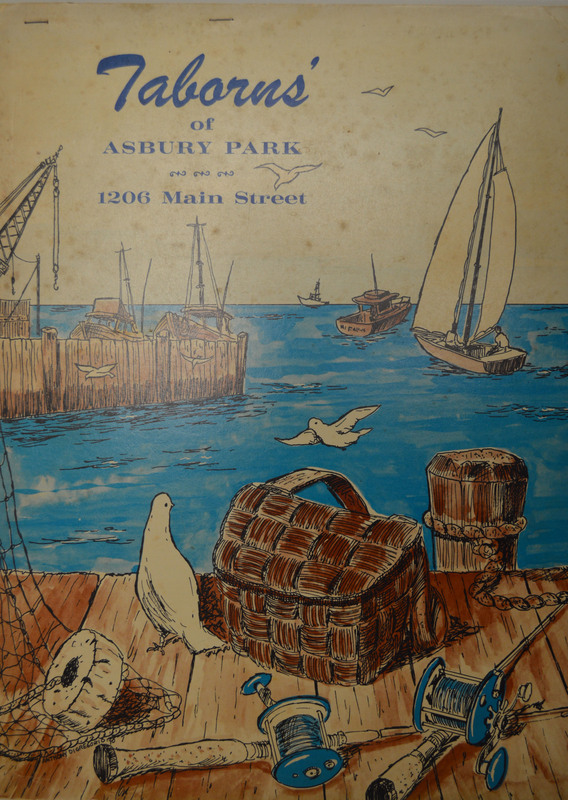 Sinclair New Jersey Restaurant Menu Collection. In Atlantic City, guests at the famous Marlborough-Blenheim Hotel sat down for afternoon tea, then tucked into roast goose with apple sauce for dinner. Camembert cheese and pineapple pie finished off the meal. Marlborough Blenheim Hotel, 1931. Sinclair New Jersey Restaurant Menu Collection. But fancy hotels weren’t the only places to get a good dinner. In the 1960s, Taborn’s Restaurant in Asbury Park served up fried shrimp, scallops, clams, and oysters, along with a wide variety of ice cream sodas, milkshakes, and fresh parfaits for a sweet finish. The lunch menu included grilled frankfurters and blueberry griddle cakes. Taborn’s Restaurant, 1960s. Sinclair New Jersey Restaurant Menu Collection. Looking for more shore delicacies? The new Sinclair New Jersey Restaurant Menu collection contains these menus and many more– down the shore and around the state.